< Chocolate and heat are great together. That is, if you're brave enough to handle a little something spicy with your chocolate. I know I am, but I also know that some people are big cowards. I'm sure that's not you. Scaredy cats like that probably bug the pants off you. Anyway, since you and I are similarly stouthearted when it comes to our peppers, I felt like making us up a batch of something hot-chocolatey. Chocolate usually gets paired with cayenne, which is nice. But I was curious about what would happen if I tried combining it with the flavor or fresh habanero peppers instead. 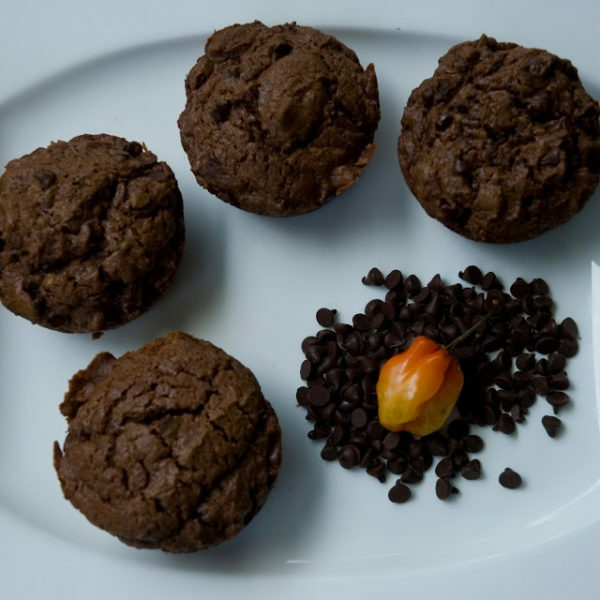 So I chose this excellent double chocolate muffin from Cookie Madness, sneaked in a couple of very hot, very fresh peppers from a local farmer’s market, and voila! New favorite muffin of the week. 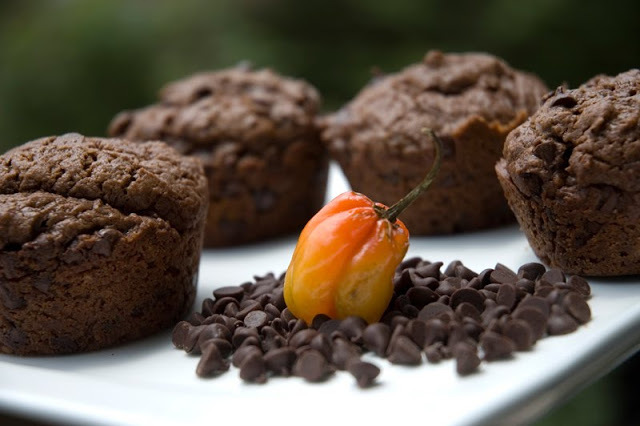 The chocolate doesn’t leave room for much of the pepper’s sweetness, but fresh pepper flavor peeps through and gives the muffin a familiar-but-more-interesting-than-expected taste. Each deliciously dense and chocolatey bite is followed by a surprising lingering spiciness. On the other hand, you could use just one little pepper if you’re some kind of sissy who can’t handle a little heat, like for instance if you are a giant chicken posing as a man. *I’m not actually sure that you can break down Scoville units that way, but if a pepper rates at 100,000 and you divide three of them amongst a dozen muffins, then maybe each muffin contains 100,000*3/12—aka 100,000/4, aka 25,000—units? I don’t know. I would be interested in knowing if it works that way. Anybody? Preheat oven to 350. Grease a muffin tin. Coarsely chop the peppers and place them (seeds and all—be brave!) into a blender. Add yogurt, egg and vanilla. Puree until the pepper is fully pureed and the whole mixture is smooth. Stir brown sugar and melted butter together in a medium size bowl, then add the yogurt mixture and stir until thoroughly blended. Combine flour, cocoa, salt and baking powder in a large mixing bowl. Add yogurt mixture to flour mixture, stirring only until blended. Too much stirring will turn your muffins into bricks. Spoon batter into greased muffin cups and bake 22-25 minutes.